Alexander Sergeyevich Dargomyzhsky (born February 14 [Feb. 2, O.S. ], 1813, near Tula, Russia – died January 17 [January 5, O.S. 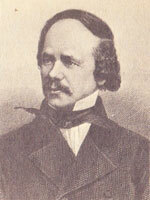 ], 1869, St. Petersburg), an outstanding Russian composer and pianist. The realistic and nationalistic elements in Dargomyzhsky’s major works – the operas Rusalka and the Stone Guest and three tone poems – had considerable influence on Borodin, Mussorgsky and other nationalistic Russian composers, as well as on more cosmopolitan composers such Tchaikovsky. Besides operas, Dargomyzhsky’s other compositions include nearly 100 songs, numerous piano pieces, and orchestral works. Alexander Dargomyzhsky was born in the village of Troitskoye, Tula district, into aristocratic family. Alexander’s father, Sergey Nikolayevich, was an illegitimate son of a wealthy landowner Vasiliy Ladyzhensky. Sergey Nikolayevich was a postal official in Moscow. Alexander’s mother, Maria Borisovna Kozlovskaya, was a princess, she married Sergey Nikolayevich against the wishes of her parents. The couple had three sons, of which Alexander was the last-born, and three daughters. Maria was a well-educated woman. She wrote poems and short drama plays that were published in almanacs and magazines. Dargomyzhsky’s mother wrote poems for her children that were mostly edifying. The future composer spent his childhood partly in the country, partly in Moscow. In 1817, the whole family left Moscow for St. Petersburg, where Alexander’s father had been transferred, he started working in the Bank’s office. As a boy Alexander had many ailments and did not speak until he was five years old. This affected the voice, which remained squeaky and highly-pitched, however, such features did not prevent the musician from mastering vocal technique. As most of noble children, he was educated at home. Alexander studied history, poetry, literature and foreign languages. From early childhood he began to receive music education. The first instrument was the piano; he began learning to play it when he was six. At the age of nine, Alexander began to master the violin and string quartets. His main love was still a piano, for which he already wrote several songs and works of other genres. Some of them were even subsequently published when the composer had already gained wide popularity. During the period of study Dargomyzhsky changed several music teachers. He learned to play the piano under composer and pianist Franz Schoberlechner and studied singing and music theory under Benedict Zeibich, a tenor at St. Petersburg’s German Opera. Following in his father’s footsteps, at the age of fourteen, he became a government official and was promoted regularly. By the age of eighteen Dargomyzhsky was already the author of many pieces for piano, violin, two quartets, cantatas, songs and romanced based on the poems of Pushkin and Zhukovsky. He was known as a good pianist in the capital, he played the violin and viola, singing his own romances, participating in amateur concerts and publishing his works. But his compositional technique was still insufficient. Mikhail Glinka, (June 1, 1804 – February 15, 1857), a famous Russian composer, often referred to as the father of Russian classical music. In 1835 Dargomyzhsky met Mikhail Glinka who had just returned from abroad and was about to complete his first opera A Life for the Tsar. Dargomyzhsky’s acquaintance with Glinka turned his thoughts more seriously toward composition. Experienced composer greatly influenced the budding comrade. The composers soon became close friends. Glinka lent Dargomyzhsky the copy-books in which he had noted down all the substance of the lessons in technique he had received from his teacher, Siegfried Dehn, in Berlin. 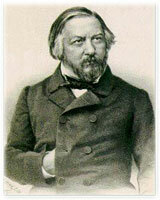 Glinka encouraged Dargomyzhsky to undertake a serious study of music theory. Glinka’s opera A Life for the Tsar inspired Dargomyzhsky to create his own opera Esmeralda based on the plot of the Victor Hugo’s novel Notre-Dame de Paris. At that time, he was very much under the influence of French literature and music. The opera was completed in 1841 but its performance was delayed for several years, it was staged in Moscow in 1847. Dargomyzhsky’s friends, the leading writers, welcomed the opera but its premiere was unsuccessful. After the completion of the opera Esmeralda, Dargomyzhsky composed the theatrical cantata The Triumph of Bacchus (Torzhestvo Vakkha) based on Pushkin’s text, later it was rewritten into opera-ballet. He wrote a large number of songs, mostly for female voice, and many of these became popular. Dargomyzhsky resigned his government position and undertook an extended trip to Western Europe in 1844. He visited Berlin, Paris, Brussels and Vienna. The trip brought a lot of new impressions, he met many leading musicians and composers of the day including Meyerbeer, Halevy and Donizetti. There Dargomyzhsky frequented the opera and the theatre. He came back with a new nationalistic feeling and started studying Russia’s folk music and its typical speech intonations, imitating these in his music. At home Dargomyzhsky set to work on his next opera Rusalka. It was written in a new, natural declamatory style. His opera, Rusalka, based on the dramatic poem by Pushkin, adapted by the composer, was completed in 1855 and premiered at the Theatre-Circus in St. Petersburg in the following year, but not well received. 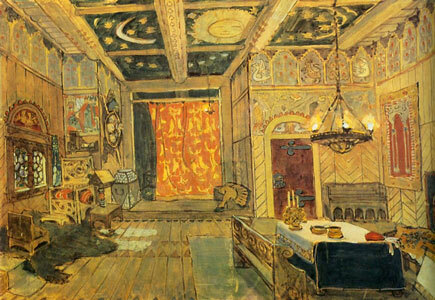 It was not until being mounted again at the Mariinsky Theater in 1865 that he gained positive recognition for the work. In 1859 Dargomyzhsky started collaborating with an influential St. Petersburg satirical journal Iskra (the Spark). In his songs Dargomyzhsky developed an individual vein of humour and satire. During this period he wrote a few brilliant vocal pieces – The Old Corporal (Staryi kapral), O, Maiden, Rose (O, deva-roza), Paladin. His orchestral pieces Finnish Fantasia (Fantaziya na finskiye temy), Cossack Dance (Kozachek), and Baba-Yaga were notable for their harmonic experiments. In 1859 he became a board member of the Russian Musical Society. 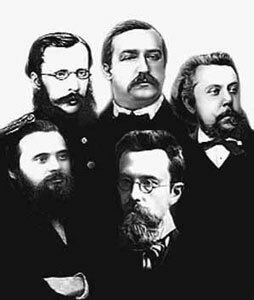 Dargomyzhsky got acquainted with the group of young composers (Mily Balakirev (the leader), Aleksander Borodin, César Cui, Modest Mussorgsky, Nikolai Rimsky-Korsakov) that became known as the Mighty Handful or Balakirev Circle (Moguchaya Kuchka). He became the elder patron, but not a member, of the Mighty Handful, serving to bridge the gap in Russian opera composition between Mikhail Glinka and the later generation, including Tchaikovsky. In the early sixties, Dargomyzhsky started composing the comic fairy-tale opera Rogdana, but he did not finish it – only a few fragments have reached us. Judging by the fragments, the opera Rogdana was conceived as an analogue to Glinka’s Ruslan and Lyudmila. He also left other unfinished opera projects, among them an attempted setting of Pushkin’s Poltava, from which a duet survives. After 1866 he became interested in developing a Russian national music of great dramatic realism and began to set Pushkin’s play The Stone Guest (Kamennyy gost’) to a species of melodically heightened recitative, with entire passages composed in the whole-tone mode. The work is unique, in that Dargomyzhsky attempted to compose the entire piece without altering a single word of the poem. It was his most famous work, and considered a ground-breaking endeavour in melodic recitative. In 1867 he was elected a director of the Petersburg branch of the Russian Musical Society. The duties of that position and his frail health did not permit him to finish The Stone Guest. According to his will, it was completed by César Cui and orchestrated by Nikolai Rimsky-Korsakov. It premiered in 1872. It has never been a theatrical success. The Stone Guest profoundly influenced Modest Mussorgsky, whose incomplete opera, The Marriage, attempts a similar exercise. Dargomyzhsky composed about one hundred romances. Their quality varies substantially. The earlier works do not differ significantly from the popular romances of the time. They are elegant, yet not overly original examples of Russian bel canto. His later works, however exhibit the skill and sophistication of a mature composer. Dargomyzhsky had already achieved remarkable dramatic truth in the part of the Miller in Rusalka and in his songs. In composing The Stone Guest, he attempted to set music to Pushkin’s play “just as it stood, without altering a word.” In his endeavour, he completely abandoned self-sufficient melody for the music of speech intonation, using whole-tone themes and harmonies. Dargomyzhsky with his Rusalka opened a broad path for the development of Russian realistic opera, for Russian musical drama. The power of the opera Rusalka lies in its truthful musical and scenic rendering of dramatic situations and characters. In Slavic folklore rusalka is a water nymph or mermaid, reputed to be the soul of a drowned maiden who committed suicide, famous for haunting and tickling unwary young men to death as she pulls them down into the water. Dargomyzhsky’s opera Rusalka, was written in 1848-1855 to his own libretto, based on the unfinished dramatic poem by Alexander Pushkin. It premiered at the Theatre-Circus in St. Petersburg in 1856, but the opera was not well received. The revival of the opera was mounted at the Mariinsky Theater in 1865. Rusalka is an opera in four acts, six tableaux. 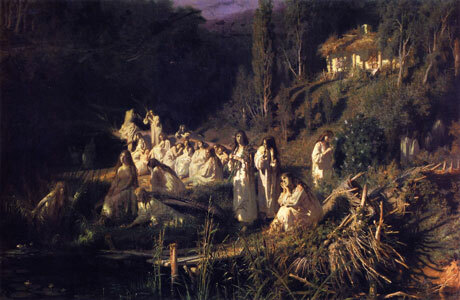 The plot tells of a peasant girl who after being seduced and abandoned by the Prince drowns herself in the Ukraine’s Dnieper river and becomes Tsarina of the water nymphs, rusalkas. A young Prince falls in love with a peasant girl Natasha, a Miller’s daughter. Miller’s Aria (‘Oh, It’s just that all you young girls’ Okh, to-to vse vy, devki molodyye) opens the first act. In the music of the aria Dargomyzhsky depicts Miller’s traits of character – penchant for buffoonery and at the same time grouchiness. The Miller encourages their relations out of self-interest, he wants to see some profit from the Prince’s favour and instructs Natasha how to behave with him. The Prince often visited them, and Natasha has fallen in love with him. It is already several days since she last saw the Prince. Natasha is waiting for her beloved. The Prince enters, Natasha rushes to him. He greets her and the Miller. 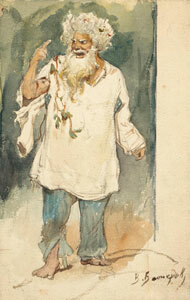 Their Terzetto begins (it characterizes the sad mood of three persons – Natasha, the Prince and the Miller). Natasha has recently noticed that the Prince’s feelings towards her have cooled (‘Alas, passed the golden time’ Akh, proshlo to vremya, vremya zolotoye). He brings a necklace as gift to Natasha. The Miller calls the peasants to comfort the Prince with singing and dancing, though the latter remains unaffected. The Prince has come to tell her of their impending separation. He intends to marry and take for himself a bride better befitting his rank: “Princes are not free to marry their heart’s desire…” Natasha informs the Prince that she is pregnant. The Prince promises not to abandon her and the child and bidding her a brief farewell, he departs. Heartbroken, Natasha blames her father for her predicament, she reproaches him for having encouraged her relations with the Prince out of self-interest. Driven mad by despair Natasha commits suicide by jumping into the Dnieper river. She becomes a water nymph, rusalka. The human Natasha, appearing only in Act I, remains largely undefined as a character. Having no solo, she sings two duets (Prince, Natasha) and (Miller, Natasha) and a trio (Natasha, Miller, Prince) with the main male characters. The Prince is celebrating his marriage. He and his bride vow their love to each other. The chorus of guests glorifies them. The Princess bids her farewell to her girlfriends. The Prince swears to dedicate his whole life to his wife. The guests sing a wedding chorus. Choral scenes give way to the dances – Slavonic and Gypsy. The Matchmaker calls the girls to sing. They sing the comic song Svatushka (Matchmaker). All are rejoicing, but the wedding feast is interrupted by a sad song performed by an invisible bodiless spirit. Natasha sings a short song about a beautiful maiden who drowns herself and curses her beloved (‘Above the gravel and yellow sand the fast river springs’ Po kamushkam, po zheltomu pesochku probegala bystraya rechka). 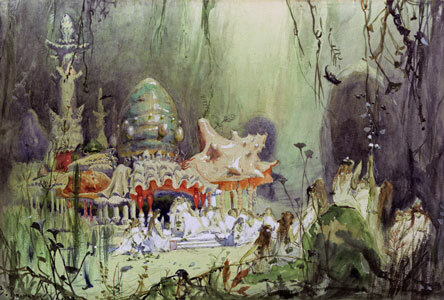 Natasha’s Song combines the sorrow of the melody of the Russian protiazhnaya (‘prolonged’ folk song) – simple and touching – and, at the same time, with its cold colouring, draws the image of another Natasha, no longer a real, passionately loving girl, but a fairy water nymph, rusalka. The Prince is frightened, he recognizes Natasha’s voice and orders the servant to find and take the Miller’s daughter away. The Princess says that a sad song at the wedding is a bad omen. When the Prince attempts to kiss his young bride a woman’s moan is heard. The wedding feast is completely overshadowed. All are in confusion. The Princess is despondent because, after twelve years of marriage, she is ignored by her husband, who seems to prefer riding his horse and hunting to tenderness and companionship. As the years pass, the Prince, estranged from his wife, finds himself lured to the riverbank and to the old oak where he was happy with Natasha. The Prince’s thoughts dwell increasingly upon the past, his memories trouble him. The Princess is sad in her loneliness. Her friend, Olga, tries to cheer her up with a folk song. The Huntsman tells the Princess about the Prince’s activities. Having learned that the Prince plans to spend the night alone on the banks of the Dnieper, Olga and the Princess set out to look for him. The rusalkas emerge from the water singing. After twelve years, the Prince still cannot get Natasha out of his mind. He comes to the riverbank where a mill once stood and where he had known happiness for the only time in his life ‘Here is this memorable oak tree! Here she embraced me…’ When the rusalkas notice the Prince, they soon dive back into the river. Prince’s Cavatina begins with singing recitative (‘To this sad shore I am unwillingly lured by a mysterious force’ Nevol’no k etim grustnym beregam menya vlechet nevedomaya sila). Suddenly a dreadful old man in rags leaps out from behind from the bushes, calling himself the local raven. The Prince recognises him as Natasha’s father, the Miller, who has become insane after Natasha drowned. The Prince learns about her fate. 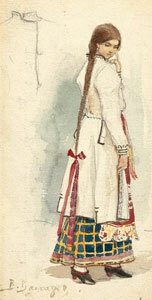 The Miller reveals that he has a grandchild – Rusalochka (little water nymph). The Prince invites the Miller to his palace, but the Miller refuses, fearing that the Prince “will choke him with a necklace.” Emotional regret and lament are revealed in the duet of the Prince and the Miller, in which the Prince declaims repeatedly: “My heart is broken, my soul is full of pain. … Alas, it is I who is guilty of all disasters.” The Miller demands that the Prince return his daughter. He attacks the Prince. Hunters rush in and save their master. Natasha is now Tsarina (Queen) of the Dnieper and the rusalkas. She sends them to the surface to play in the moonlight, but do no harm to anyone. The sound of the harp signals the departure of Rusalochka, the 12-year-old daughter of Rusalka and the Prince. Rusalochka does not sing, but speaks. 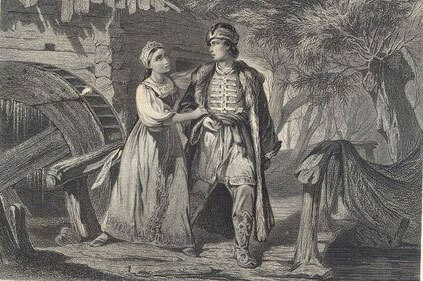 Rusalka orders her daughter to meet the Prince, Rusalochka’s father, and instructs her how to lure him to the riverbank (‘Tell him, my darling, tell him that I call on him and I wait for him!’ Skazhi yemu, moy drug, skazhi, chto ya zovu yego i zhdu!). Their dialogue is coloured by the harp, and 6/8 waltzlike rhythm reinforces the association of Rusalka’s realm with dance. Natasha still loves the Prince, but she desires the revenge on her rival in love, the Princess. The main heroine receives a scene and aria (Rusalka’s Aria), a solo at last – her Siren’s Song, in which she promises vengeance. The Princess and Olga appear, when they see the Prince, they hide behind the ruins of the mill. Rusalochka rises from the water and approaches him, the Prince is stunned by the sight of the daughter he never knew: (‘Where are you from, lovely child?’ Otkuda ty, prelestnoye ditya?’). She tells of her mother, who is now Tsarina of the Dnieper and the rusalkas. Rusalochka invites him to visit the woman he loved and abandoned. His wife and Olga try to hold the Prince back, but the Miller, who has crept unnoticed, pushes him into the water. The rusalkas take the Prince’s body to their Tsarina. Opera in Four Acts, Six Scenes. Libretto by the Composer after a like-named Play by A. Pushkin. Vocal Score. Opera in 3 acts. Text by A.Pushkin. Piano score. The action takes place in Spain.